Coach Cam’s first commitment of the 2019 class, guard Brylee Bartram put recruiting on the right track back in the spring when she decided to join the orange and blue. A flamethrower from behind the arc she uses excellent footwork and intuitive court savvy to read screens, make reads, and punish defenses. 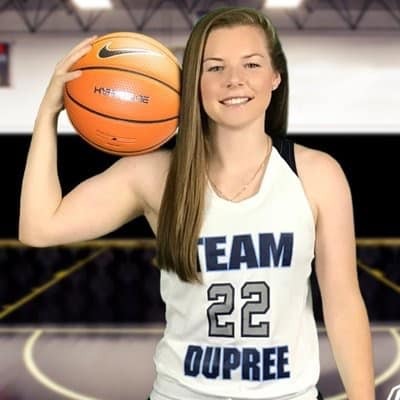 One of the most experienced high school basketball players you could ever find, an early start to varsity basketball sees her already with 5 seasons and 149 games going into her senior year and that veteran savvy finds herself the leader of her high school and AAU teams, Seffner Christian and Team Dupree. Here is a quick interview she was gracious enough to give me as I asked her about her ability to shoot the rock and her high school basketball career so far. EF: I really appreciate you doing this Brylee! Can you start by telling us where you’re from and what your basketball journey has been like up until this point? BB: Yeah sure, no problem! I actually was born in West Virginia but I moved to Atlanta when I was really young and grew up there. I grew up around basketball, it runs in the family. My dad played at Penn State and has always been a coach, he helped develop me into the player I am today. In middle school I moved down to Florida and started playing varsity basketball as a 7th grader. Since then I’ve just worked extremely hard and God blessed me with many opportunities to play at the next level. EF: I actually saw statistics from you that had varsity stats when you were in grade 7 and 8 but I assumed that HAD to be wrong and was going to ask you about that! For people reading this, not only were you on a varsity team at 7th grade, you were playing minutes and contributing too. How did playing varsity when you were so young help you develop? BB: It definitely played a huge part in separating myself from other players. I was always the youngest on every team so I had to work so much harder because of it. I think it made me stronger mentally and definitely physically, so when I finally started playing against girls my own age I could feel a big difference. 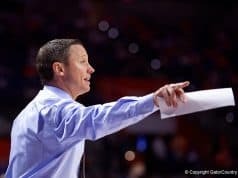 EF: By the way, I saw you shot 81% from the free throw line as a 7th grader playing varsity, and I coach senior varsity hoops and it’s a struggle to get seniors above 75% (laughs). So that’s extremely impressive of you. What kind of player was your dad when he was at Penn State and as a coach what specific ways has he helped your game? BB: (laughs) Thank you. My dad was a 6’5” shooter and slasher. He knows a lot about the game which is why he’s such a great coach. He’s helped me in so many ways. From countless hours in the gym with me to watching film and helping me see how I can improve, he’s always been there for me, along with the rest of my family. They’re all supportive and they all help me follow my dreams. EF: Was his experience as someone who went through the process also helpful when it came to your recruitment? BB: Absolutely. He never once tried to influence me but he would always help me see things and weigh the positives and negatives of each school. He helped me keep my priorities straight. EF: That’s awesome. You committed to the Gators back in the spring, a fairly early decision considering you’re in the 2019 class. 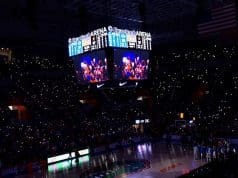 What ultimately made you decide on Florida, and why did you make your decision so early as opposed to so many players who wait longer before making a choice? BB: Throughout my whole recruiting process I always felt like I would know the right time and the right school to commit to. Florida was it for me. I love the school, the staff, the team, the opportunities, and the atmosphere. Some would say my commitment was early but it was right on time for me. My family and I talked and prayed about it and I just knew in my heart I was making the right decision, and since then I’ve been so happy with it. EF: I’m glad you made the decision to become a Gator! Let’s talk a bit about your game. How would you describe yourself as a player? BB: I would describe myself as a competitor. I don’t like to lose and whatever it takes to win, I’m going to do. I’m definitely known for shooting the 3-ball but there is more to my game than that. I consider myself a good leader, a hustler, and an all-around tough player. EF: It’s good to hear a bit more about your game because your reputation as a 3-point shooter is pretty established and for good reason as you shot 48% as a freshman, 47% as a sophomore, and 48% again as a junior. Lots of players can heat up from time to time but being as consistent as you are is way more impressive. What have you done to develop that consistency to your stroke? BB: I’m constantly in the gym, making hundreds of shots a day. I’ve been like that since I was little. It’s actually simple, but it’s not always easy making yourself get up and go to the gym even when you’re tired or drained. But being consistent in your workouts will cause you to be consistent in games and I’ve always stood by that. EF: It seems to work for you! The way you get your feet set and the way you transfer the ball up from your shooting pocket is amazing to watch for anyone like me who is a shooting mechanic nerd (laughs). 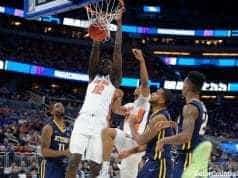 What is something you’ll be working on this year to get ready for the challenge of SEC basketball? BB: Speed and strength. I’m so excited for the opportunity to play in the SEC and prove a lot of people wrong. From now until I get there next year I’m going to work on expanding my game and adding to it so I can become the best player I can be when I get there. EF: You mention proving people wrong…where are your doubters coming from and how much of a motivating factor is that? BB: “She can’t play in the power 5,” “She’s too slow,” “She’s too small,” “She’ll never play in the SEC,” “All she does is shoot.” Some people just like to talk, which is fine but as I said, I’m competitive. Hearing things like that just make me want to work harder to accomplish things, not for them, but for me. I want to make my family and friends proud. EF: I’m sure your family and friends are already very proud of you and I can tell that their encouragement speaks much louder to you than the words of your haters. Playing at the highest level at Florida, you’ll definitely have the chance to prove yourself! When you’re not on the court, what do you like to do for fun? BB: Just normal kid stuff…hangout with friends, go to the movies, the beach, or just chill at home and relax. BB: Hmm…some of my all-time favorites are Love & Basketball and Step Up. But recently, I would have to say Oceans 8 or Incredibles 2. The last bad movie I saw was probably A Quiet Place. EF: Oceans 8 was incredible! And I stayed away from A Quiet Place so I’m glad to hear it was bad. I also didn’t want to see John Krasinski as anyone other than Jim from The Office (laughs). Thank you so much for your time Brylee! BB: Of course, no problem! You can follow Brylee on Twitter and Instagram at @BryleeBartram.